Portugal is historically a country of maritime adventurers, shipowners and shipbuilders. Portugal's geography, which includes the archipelagos of Madeira and the Azores and a long Atlantic coast, calls for port activity and places Portugal as an entry point for the transport of goods into Europe. Notwithstanding this, the shipping industry in Portugal has been struggling in recent decades. Currently, the number of newly built ships is relatively low and shipyard activity is mainly focused on repairs and maintenance. In addition, a significant number of shipowners active in Portugal correspond to international carriers and not to nationally run companies. In this context, Portugal is taking the opportunity to regain its importance as a player in the shipping sector through the International Shipping Register of Madeira (MAR). MAR is a second shipping register operating under the Portuguese flag, open to non-residents and allowing registration of both commercial vessels and yachts. MAR was created in the late 1980s within the International Business Centre of Madeira (IBCM), which consists of a set of incentives, mainly of a tax nature, approved by the European Commission and currently in its fourth version. MAR offers attractive conditions for shipowners and crew members, while ensuring high levels of security. MAR is proving to be very successful in attracting foreign investment and is now one of the largest shipping registers in Europe.2 At the end of October 2017, MAR had 562 ships, including vessels and yachts. This means that in the past two years MAR has grown in over 70 registers per year. As a consequence of the above, and drawing on our experience, domestic financing for the construction and acquisition of vessels currently maintains a residual importance, while the relevance of Portugal as a flag-state is increasing. In fact, in recent years there have been several significant financings for the construction or transfer of ships, at an international level, connected with Portugal through MAR. The registration of vessels in MAR calls for the application of the Portuguese jurisdiction, mainly as concerns security packages. The main Portuguese airports are located in Lisbon, Porto, Faro, Funchal (Madeira) and Ponta Delgada (the Azores). More than half of the movements and passengers go through Lisbon airport. In 2017, an overall increase of activity in all the main airports was noted. The force behind this increase is international air passenger transport, in which low-cost airlines − specifically easyJet and Ryanair − are playing a significant role. According to the information available for the third quarter of 2017, the most important airlines at the main airports are TAP, Ryanair and easyJet. Although TAP is the overall most important airline (carrying 50 per cent of Lisbon airport's passengers), in Porto, Ryanair is the most important airline, being responsible for 26 per cent of the movements and 35 per cent (compared with 17 per cent TAP) of the passengers. In Ponta Delgada, the presence of SATA Air Açores and SATA Internacional is also very significant, whereas in Funchal Transavia Airlines replaces Ryanair in the Top 3.3 Monarch Airlines Ltd, having appeared as an important new player in 2016, particularly in the airports of Faro and Funchal, shut down in October 2017, which will give room for the further establishment of Transavia Airlines and Jet2.com (Channel Express) in those airports. At the end of 2016, there were 1,222 aircraft registered in Portugal, which represents an increase of 11 aircraft in relation to 2015. The total number of aircraft includes 604 intended for private transportation, 235 for non-regular transportation and 77 for regular and non-regular transportation. There were also 27 companies licensed for air transportation and 15 for executive aviation.4 In our experience, numerous aircraft are operated in our jurisdiction under lease or financial lease agreements. The railway network in Portugal is currently managed by Infraestruturas de Portugal, SA (IP), a public company that resulted from the merger of Rede Ferroviária Nacional – REFER, EPE (REFER) and EP – Estradas de Portugal, SA, enacted by means of Decree-Law 91/2015, of 29 May and which is responsible for managing road and rail infrastructures, under a concession agreement. The main changes to the transport industry in Portugal over the past five years consist of political responses to the global financial crisis, implemented through legislative or regulatory measures. In this context, the privatisations of both a national shipyard (Estaleiros de Viana) and the management body of the main Portuguese airports (ANA) took place. Transportes Aéreos Portugueses, SA (TAP), the national airline, has also been partially privatised. There is some public investment being made in the port sector. In this regard, Resolution of the Council of Ministers No. 175/2017, of November 2017 approved a strategy aimed at increasing competition in the commercial ports of continental Portugal, for the period up to 2026. The strategy sets out specific investments to be made in ports including, among others, Leixões and Sines. Concerning private investment, the 2020 Operational Programme for the Sea (Programa Operacional MAR 2020) was approved by the European Commission on 30 November 2015. The programme has been implemented in different instruments approved throughout 2016. Among other things, the programme sets out measures to support investment in fishing ports and energy efficiency in fishing vessels. In a different matter, in the judgment of the Court of Justice (First Chamber) of 11 September 2014 (Case C-277/13), Portugal was censured in connection with competition restrictions at Lisbon, Porto and Faro airports concerning ground-handling activity (baggage handling, ramp handling and freight and mail handling). In spite of this, Parliament Resolution No. 78/2016, approved on 31 March 2016, provides some guidelines that show that the liberalisation process of the ground handling services in Portugal may be put on hold. Portugal has also been undergoing changes over the past few years aimed at enabling or providing incentives for transportation on electric power and on the increase of the renewable sources of energy. In summary, some of the main changes to the transport industry in Portugal over the past years concern the increase of private investment in traditionally publicly held companies and the international pressure to allow competition, together with the increasing awareness of the relevance of technology and environmentally friendly sources of energy. The financing of aviation, rail and shipping assets is not subject to specific regulations in Portugal. In general terms, the common legislation applicable to civil and commercial matters applies. Notwithstanding this, there are certain specificities particular to the financing of transport assets when security interests are created. Mortgages are the most common guarantee granted in Portugal to secure the financing of transport assets and may be subject to specific rules, depending on the financed asset and its registration rules. Finally, it should be noted that the legal framework applicable to transport matters in Portugal is highly fragmented. There are numerous outdated provisions and conventions, which sometimes overlap with European Union instruments or conflict with common practices. 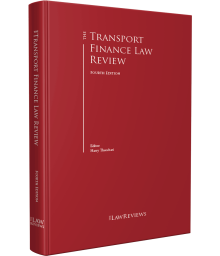 Even though this general note does not apply to MAR's specific regime nor does it currently deter transport finance in Portugal, this factor should be taken into consideration by operators in the Portuguese transport sector. Commercial ships in Portugal are subject to a dual registration system (the administrative register and the commercial register), while recreational craft are subject to a single register. Thus, mortgages over commercial ships in Portugal must be registered with the Commercial Registry Office, under the terms of Decree-Law No. 4264, of 14 November 1959. Mortgages over recreational craft must be registered with the captaincies, under the terms of Articles 19 and 77 of the General Regulation of Captaincies and Regulation of Recreational Navigation, established by Decree-Law No. 124/2004 of 25 May. Also, pursuant to Article 589 of the Portuguese Commercial Code (the Commercial Code), mortgages over vessels may guarantee up to five years of interest, while the ordinary regime set out in Article 693 of the Portuguese Civil Code (the Civil Code) only allows for a maximum of three years. Finally, DL 96/89 sets out some specific rules applicable to mortgages registered in MAR. In fact, and among other specificities, MAR's regime allows the parties to choose the law applicable to the mortgage. This option may be particularly interesting taking into consideration, for example, that a mortgage under Portuguese law may not allow for self-help remedies. If the parties fail to choose the applicable law, Portuguese law will apply nevertheless. In that scenario, however, the right to release a mortgage set out by Article 721(b) of the Civil Code will not apply. Such a right would allow the acquirer of the mortgaged asset to cancel the mortgage by paying the mortgagee an amount equal to the price paid for the mortgaged asset. Pursuant to the MAR regime, release under those circumstances can only occur if the acquirer undertakes to pay the mortgagee for all rights under the mortgage agreement. Concerning aviation, the registration of aircraft in Portugal must be submitted to the ANAC, further to Decree 20062, of 13 July 1931 (the Air Navigation Regulation). ANAC is also competent to register mortgages. Finally, it should be noted that Portugal did not sign the Cape Town Convention on International Interests in Mobile Equipment. Under Portuguese law, rights in rem usually are constituted or transferred by means of the applicable agreement. However, mortgages require registration and will only be deemed incorporated upon registration, which should be carefully provided for within a financing. The possibility of choosing the law applicable to the mortgage registered in MAR should be carefully evaluated, taking potential discrepancies between applicable jurisdiction and applicable law specifically into consideration, as well as accounting for any enforcement issues that could arise. Finally, and given the fragmented legal framework applicable to the Portuguese transport industry, it is advisable to liaise beforehand with the competent authorities for the registration of the financed asset concerning any aspect of the transaction that may give rise to registry or regulatory issues. In this regard, it should be noted that MAR is very approachable and usually renders timely and useful support for the clarification of any doubts arising in a specific transaction. In Portugal, only credit institutions have permission to grant credit as a professional activity. The legal definition of a credit institution is provided by Decree-Law No. 298/92, of 31 December (DL 298/92). DL 298/92 enacts the General Credit Institution and Finance Companies Regime, which regulates the activities of banks and other financial institutions. According to DL 298/92, credit institutions are defined as entities whose activity consists of receiving deposits from the public − or other kinds of repayable funds − and granting credit on their own account. Only entities expressly recognised as credit institutions are authorised to carry out financing activities. Obviously, banks, as the main credit institutions, assume a central role in the field of financing activities. Portugal is part of the single supervisory mechanism, with the banking system supervised by the Bank of Portugal (BdP) in partnership with the European Central Bank (ECB). Created to ensure the safety and soundness of the European banking system, the single supervisory mechanism comprises the ECB and the competent national authorities of each Member State of the euro area (of which the BdP is part). The ECB directly supervises the main credit institutions, while the BdP is responsible for the supervision of the remaining institutions. Notwithstanding this, the ECB has the power to replace the BdP at any time and directly supervise the other institutions. In addition, whenever credit institutions or financial companies also pursue financial intermediation activities, they will be subject to the supervision of, and regulations issued by, the Portuguese Securities Exchange and Market Commission (CMVM). The same applies to the insurance intermediation activities that may be pursued by banks, which are also subject to the supervisory powers of the Portuguese Insurance and Pension Funds Supervisory Authority, being required in such case to comply with the regulations or circular letters issued by the latter. The need to ensure the safety and soundness of the national (and European) banking system after the 2007 international financial crisis, and the adoption of the Basel III Agreements − which were implemented in the European Union through Directive No. 2013/36/EU and Regulation No. 575/2013 − resulted in the implementation of a set of important measures intended to ensure the solvency and liquidity of banks and to reinforce the powers of the supervisory authorities. Consequently, among other aspects, Portuguese banks are now obliged to ensure that their own funds are never below the minimum amount of share capital legally required. Additionally, current Portuguese legislation compels banks to have a minimum share capital of €17.5 million for banks and €5 million for investment firms in general. Under Regulation No. 575/2013 on prudential requirements for credit institutions and investment firms, institutions must maintain a common equity Tier 1 (CET1) capital of at least 4.5 per cent of their risk-weighted assets (RWAs), a Tier 1 capital of at least 6 per cent of their RWAs and a total capital of at least 8 per cent of their RWAs. Nevertheless, and as agreed with the ECB, the European Commission and the International Monetary Fund in the contact of the bail-out package provided to Portugal in 2011, the BdP determined that Portuguese credit institutions and investment firms must have a CET1 ratio not below 7 per cent. This obligation is to last until the adoption in full by these entities of the rules applicable under the Capital Requirement Directives IV package. The supervisory system for Portuguese banks is based on two fundamental components: prudential supervision and 'supervision of conduct'. Prudential supervision has the main objective of ensuring credit institutions' financial stability and the security of the funds that are entrusted to them. Therefore, supervisory institutions have power to authorise the incorporation of credit institutions, monitor their activity, enforce compliance with the applicable regulations, issue rules and recommendations, sanction potential infractions and take extraordinary measures to correct irregularities. On the other hand, supervision of conduct compels credit institutions to respect certain standards of conduct in their relations with clients. This second component of this supervisory regime entitles supervisory institutions to establish rules to assure the transparency of the information provided by credit institutions to their clients, as well as the fairness of products and financial services transactions − either between credit institutions or between credit institutions and their clients − in addition to regulatory and supervisory powers. The legal framework also grants clients the right to file complaints with the BdP. 2017 was marked by the entry into force of two new laws, namely Law No. 83/2017 of 18 August and Law No. 89/2017 of 21 August, which provide for preventive and repressive measures to fight money laundering and terrorism financing, and partially transpose the Directive No. 2015/849/EU from the European Parliament and Council of 20 May 2015 into Portuguese law. In particular, Law 89/2017 establishes the legal regime of the Central Registry of the Effective Beneficiary (CREB). The CREB consists of a database with information regarding the effective beneficiary of entities subject to it (e.g., commercial companies), managed by the National Registry Office. All entities subject to the CREB have the duty to provide sufficient, exact and up-to-date information on its effective beneficiaries, all circumstances that indict such quality and the information on the economic interest they hold in the entities. Finally, it is important to stress the existence of a central credit register. The central credit register is a central database, managed by the BdP, that contains detailed information regarding the loans granted by credit institutions to their clients.7 All credit institutions are obliged to communicate this information, so that the BdP, on a monthly basis, may determine the amount of credit granted to each client. Through this mechanism, credit institutions are able to evaluate the risks of granting credit to a specific client with a higher degree of accuracy. In the Portuguese context, financing of new assets usually follows the traditional pattern of credit against a security interest over the asset. Accordingly, security plays a key role in both the negotiation and the execution of the asset financing agreement. The most common security required by finance providers is, unquestionably, a mortgage over the asset, but the security package may also include other instruments such as pledge over shares of ship-owing companies, pledge over bank accounts, assignment of earnings or receivables and retention title instruments. Currently, Portugal is not a party to any convention regarding securities over aviation, rail and shipping assets (such as the Convention for the Unification of Certain Rules relating to Maritime Liens and Mortgages, adopted in Brussels on 10 April 1926, and the Convention relating to Maritime Liens and Mortgages, adopted in Geneva on 6 May 1993). Portuguese law provides a specific and mandatory framework on security interests over vessels that, among other aspects, (1) sets out a list of 15 credits that enjoy a priority-ranking privilege (Article 578 of the Commercial Code) and (2) establishes that the vessel's constructor and the maritime rescuer are granted the right to retain the vessel as security for the payment of the credits arising from its construction and the maritime salvage (Article 25 of Decree-Law 201/98, of 10 July (DL 201/98) and Article 14 of Decree-Law 203/98, of 10 July). This mandatory framework prevails over any provisions set forth in the asset financing agreement and its respective security package. According to that special framework, namely the provisions of the Commercial Code, there is a special regime for mortgages over vessels, that differs from the mortgage's general framework set out in the Civil Code. In fact, the mortgagee is granted a priority-ranking privilege, which prevails (even in the event of the mortgagor's insolvency) over (1) the priority-ranking privileges provided for by the Civil Code and any other statutes (Article 574 of the Commercial Code); and (2) rights of retention subsequently constituted (Article 750 of the Civil Code). Notwithstanding this, still pursuant to the above-mentioned regime, court expenses and monetary consideration for maritime salvage are ranked as having priority over the mortgagee's credit (Article 578(1)(2) of the Commercial Code). Portuguese law does not grant specific priority-ranking privileges to entities that finance the acquisition of aviation or rail assets. As such, the lender's position − if a security interest is constituted over the aircraft or the rolling stock − results from the general framework set out in the Civil Code. In fact, Portuguese law only provides the Portuguese state, the autonomous region of the Azores and the airports managing body with a priority-ranking privilege over the aircraft as security for the payment of (1) fees due for the operation of airline companies in Portuguese airports; and (2) administrative fines imposed for infringement of the framework governing non-scheduled transport services (Article 46 of Decree-Law 254/2012 of 28 November, Article 30 of Regional Legislative Decree 35/2002/A of 21 November and Article 38 of Decree-Law 19/82 of 28 January). According to general rules, the mortgagee's credits shall be ranked as having priority over (1) the credits secured by a priority-ranking privilege that has been subsequently constituted; and (2) the credits held by entities that enjoy a right to retain the aircraft (Articles 686, 750 and 758 of the Civil Code). A secured creditor may enforce security by means of judicial action filed against the debtor, which may encompass an interim measure (namely, an arrest), a main declaratory action and, finally, an enforcement procedure in which the asset is sold through the court. The merits of the dispute may be decided in accordance with the laws of another jurisdiction if private international law leads to the exclusion of Portuguese law (e.g., in the event that the parties have validly chosen the law of another jurisdiction to govern the financing or the security relationship). It is generally stated that, after the breach of the contract, the mortgagee may take possession over the secured asset without filing a claim if the parties have entered into an agreement whereby the mortgagee undertakes (1) to request an updated valuation of the asset (in accordance with a procedure defined by the parties); and (2) to repay the amount corresponding to the difference between the asset's value and the amount of the debt. In fact, it is said that the rules prohibiting self enforcement only apply if the procedure is not agreed with the mortgagor and may not be controlled by this entity (otherwise, their rights are not jeopardised). The nationality or the address of the owner of the vessel or its domicile is thus irrelevant. The Brussels Convention can only be applied when at least one of two elements (the flag of the vessel or the domicile of the applicant for the arrest) does not have a connection with the Portuguese jurisdiction (Article 8(4)). The Brussels Convention regulates: (1) the arrest of the ship to which the credit refers (offending ship), when the debtor is the owner or the charterer or whenever a third party is a debtor of a maritime credit related to that ship; and (2) the arrest of another ship (sister ship) belonging to the person who, on the date of the constitution of the credit, is the owner or the charterer of the ship to which the credit refers, or debtor of a maritime credit, unless the injunction seeks coercive compliance regarding the credits indicated in Article 1(1)(o)(p) or (q) of the Brussels Convention. For a vessel to be arrested under this international instrument, a mere claim of the right of maritime credit suffices; it is not necessary for the claimant to present evidence for the procedure, nor to allege and prove the risk of the loss of the guarantee represented by the asset (periculum in mora) (Articles 3 and 5 of the Brussels Convention). the vessel may be arrested even if it is undertaking a journey (Article 9(1) of DL 201/98). the claimant may be liable for all damages arising out of the arrest in the event that the measure is deemed unjustified (this liability shall be governed by the Portuguese internal rules). If the arrest is granted, the asset is judicially seized and physically apprehended. Notwithstanding, the mortgagee may request the court that the vessel continues to operate until its judicial sale, if the mortgagor expressly agrees or, if said agreement is obtained, by providing an adequate guarantee (Articles 769 and 770 of the CPC). Following the arrest decision, the claimant must file a main declaratory action within 30 days, in order to obtain an enforceable decision regarding its credit and the respective security. After obtaining a favourable ruling in the main proceedings, the claimant has to file an enforcement proceeding to judicially sell the vessel. The judicial sale is carried out by an enforcement agent, in accordance with the rules set out in the CPC that sets forth several sale methods (sealed bids, public auction, private negotiation). The vessel is sold free from any charges or encumbrances and normally 'as is'. If the debtor is insolvent, the sale of the asset is governed by the Insolvency Code, as any other asset seized for the insolvency estate. In case the aircraft was acquired under a financial lease agreement, Article 21 of Decree-Law 149/95, of 24 June, entitles the financial lessor to make a request to the court for the immediate apprehension and restitution of the leased asset in the event of termination of the financial lease agreement (due, among other grounds, to an event of default attributable to the financial lessee). the court considering proved − prima facie − the defaulting event, the non-delivery of the asset and the termination of the agreement. Once the apprehension is ordered, the financial lessor is entitled to grant a third party the use of the asset, namely by entering into a sale and purchase, lease or financial lease agreement. If the aircraft is owned by the airline company, judicial action (declaratory action or enforcement procedure) has to be filed to collect the debt (through judicial sale). The main development in transport finance over the past several years was enacted by Decree-Law 8/2009, of 7 January, which amended the Commercial Code to include the credits guaranteed by mortgages or pledges over the vessel in the third position of the ranking of privileges over the vessel. This measure was followed, in 2011, by Portugal's withdrawal from the Convention for the Unification of Certain Rules relating to Maritime Liens and Mortgages, adopted in Brussels on 10 April 1926. In fact, up until those legislative measures were introduced, mortgages would be ranked in a less favourable way (from the credit institutions' perspective), which was presumably preventing registrations in Portugal (and in MAR). These changes were a turning point for creditors, which to some extent contributed to the growth of MAR. Portugal is regaining its importance in the shipping sector, and specifically in the asset finance industry through MAR. In fact, the second registry in Portugal has undergone a steady and sustainable increase over the past years and is drawing the attention of shipowners and finance parties alike. In overall, MAR currently has 562 vessels.10 In 2016,11 MAR had 491 vessels (40 commercial yachts, 73 recreational craft and 378 commercial vessels), with a gross tonnage of 12,076,294. At the end of the previous year of 2015, a total of 399 vessels were registered, with a gross tonnage of 7,925,042. The average age of the ships dropped from 11.9 years in 2015 to 11.8 in 2016. In our experience, lenders from jurisdictions as varied as Spain, China and Japan are relying on Madeiran mortgages to secure financing. MAR is not only impressive in numbers. Its safety and quality standards maintain sound recognition worldwide. As a consequence, vessels flying the Portuguese flag were included, for the first time in 2017, in the index Qualship 21 of the United States Coast Guard. Likewise, Portugal maintained its position in the White List of the Paris MoU on Port State Control, which will be valid until June 2018. The growth of MAR has been calling for a timely response by related public entities, specifically concerning the certification of crew members. Therefore, modernisation and legislative changes are being requested from the Portuguese government in this regard. As a response, Law 9/2018, of 2 March, authorises the Portuguese government to create a National System for Vessels and Maritimes, to centralise and publicise all registrations and certifications concerning maritime activity. Finally, in 2017, a tonnage tax regime and an overall more favourable tax and social security framework was created for the activity of maritime transport. Very recently, Law Proposal 111/XIII of 21 February sought to obtain an authorisation for the Portuguese government to legislate on the matter. A broad, planned reform of the legal framework applicable to the maritime and transport sector in Portugal is long overdue. In this scenario, the current refocusing of legislative efforts in the shipping sector is very exciting. 2 Refer to Decree-Law 96/89, of 28 March (DL 96/89), which enacts the legal framework of MAR, and to the information available on the official IBCM website: www.ibc-madeira.com/en/welcome.html. 3 Quarterly Statistics Report concerning 2017, available at http://www.anac.pt/vPT/Generico/PublicacoesINAC/BoletinsEstatisticosTrimestrais/Paginas/BoletinsEstatisticosTrimestrais.aspx. 4 Civil Aviation Annual Report for 2016, available at www.inac.pt/SiteCollectionDocuments/Publicacoes/anuarios/ANUARIO_16_V0.pdf. 5 The Single Port Invoice was enacted by Decree-Law 6/2017 of 6 January and Order 14/2017 of 10 January. 6 Refer to Law Proposal 50/XIII. 7 Only balances for liabilities with a value of at least €50 need to be communicated. 8 See Conceiçao Soares Fatela, 'A Locação Financeira de Aeronaves', Cadernos de Direito Privado, No. 49, January/March 2015. 9 The protective order may be as well accepted if the vessel flies the flag of a non-contracting state: in this case, the vessel may be arrested to secure a maritime claim pursuant to Article 1 of the Brussels Convention, or any other claim that legitimates the arrest according to the lex fori (Article 8(2)(3) of the Brussels Convention). 11 Official newsletter 2017-01 of CINM, encompassing data concerning 2016. 12 Information made available on the official website of the International Business Centre of Madeira: https://www.ibc-madeira.com/pt/noticias/noticias/513-ranking-da-alphaliner-quatro-maiores-armadores-do-mundo-t%C3%AAm-navios-registados-no-mar.html.